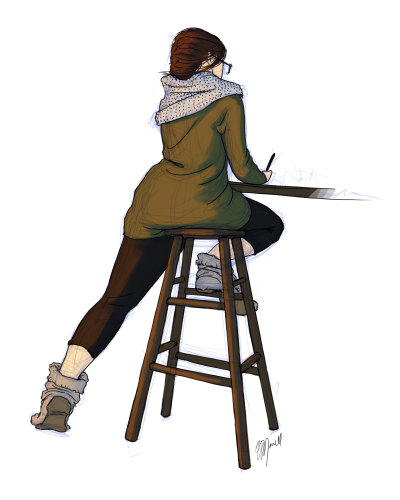 SocCal born, Washingtonian at heart, Beth currently works in sunny Los Angeles California as a freelance artist and colorist for cartoonist Dave Kellett. In 2017, she colored, designed and helped Dave kickstart the very funny "Anatomy of Animals." You should totally buy a copy. She holds a BFA in Painting from Western Washington University, and a MFA in Digital Art from Digipen Institute of Technology. While at DigiPen, she was the Art Director for Team Neat Snake and helped create the award winning 2D game, Flickers. She spends her days consuming an inordinate amount of coffee, podcasts, and TV shows, and seeks out good hiking and nature any chance she gets. Beth really enjoys funny people and cake decorating. She will cuddle any dog within arms reach. Any. Dog. If you are looking for an artist, Beth could be the one for you! Click here for her professional resume, or contact her here. Contemplating Hallmark movie titles on Old Maids, a weekly podcast about living the best single life. For musings straight from her brain in under 140 characters, follow her on twitter! Beth is also on LinkedIn.